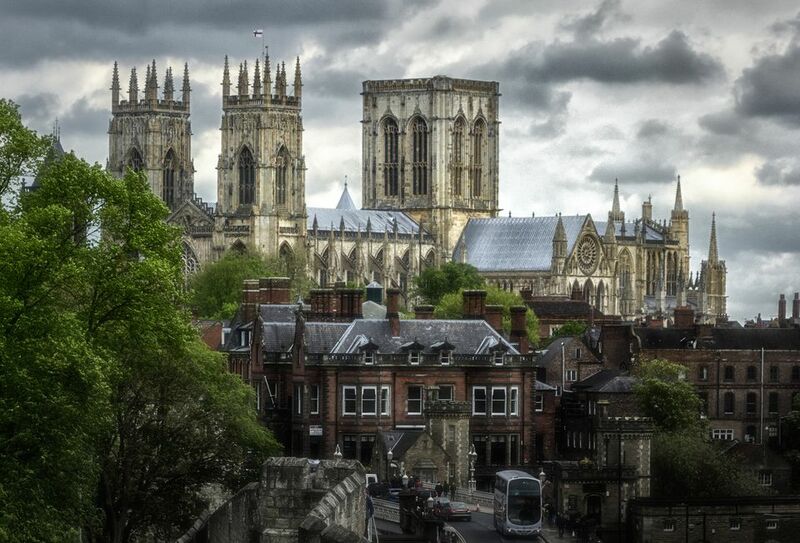 York Minster is one of England's most popular attractions. More than two million people pass through it annually from all over the world. And no wonder why: This architectural and artistic masterpiece took more than 250 years to build. It is filled with unique and fantastic carvings and the greatest collection of intact, Medieval stained glass windows in the world. Length - 525 feet (160 meters) - That's 165 feet longer than an official, NFL football field. Width - 249 feet (76 meters) - Slightly wider (by about 7 feet) than a UK soccer pitch. Height to vault - 88.5 feet (27 meters) - The interior of the main part of the cathedral is about the height of an 8-story building. West towers - At 184 feet each (56 meters), they are nearly as tall as a 17 story building. Lantern tower - 233 feet (71 meters) is about the same as a 21 story building. It's a 275 step climb up a winding staircase to reach the highest spot in the city of York. At 16,000 metric tons, it weighs about the same as 40 jumbo jets. As Northern Europe's largest consecrated Medieval Gothic space, York Minster is also one of the world's largest Medieval Gothic Cathedrals. Only Chartres, in the Loire region of France, is larger. Minster is a very old term for a collegial church, established as a community, to spread Christianity and Christian learning. Besides York Minster, only Westminster Abbey still retains this title, representing England's oldest type of ecclesiastical center. Its use in York is tied to this cathedral's long and complex history. Before construction even began on the current cathedral, around 1215, York was already a minster. It was built for the baptism of Anglo Saxon King Edwin of Northumbria, on Easter Sunday in 627. In order to marry the sister of the Christian King of Kent, Edwin, a Druid worshipper, agreed to convert. A wooden church, the first York Minster, was built for the occasion, and later replaced by a stone church. About 1100, the Normans replaced that with a much larger church, which forms part of the foundation of the current York Minster. Constantine was proclaimed Emperor of the Western Roman Empire while in York—then called Eboracum. 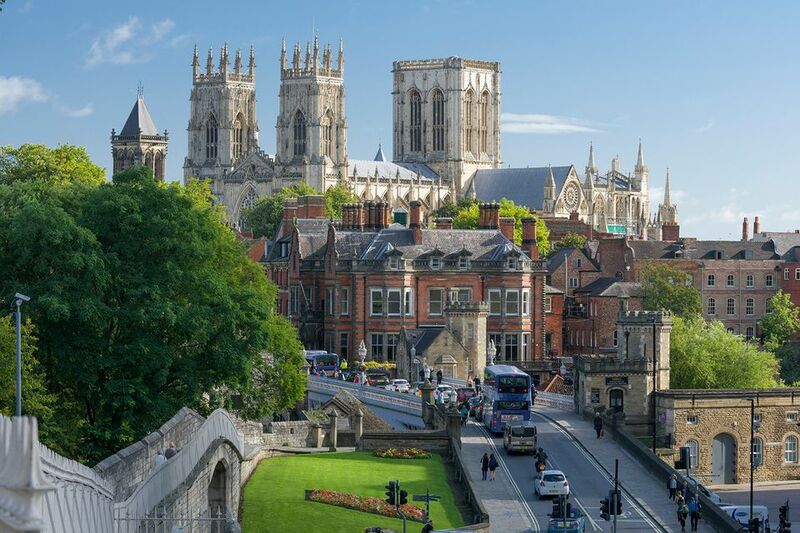 York had been an important Roman stronghold from about 70 A.D. and, between 208 and 211 A.D., the Emperor Septimus Severus ruled the entire Roman Empire from York. In 313 A.D., Constantine proclaimed religious tolerance throughout the Roman Empire, later becoming the first Christian Emperor. The proclamation of Constantine as Emperor may well have taken place in a Roman basilica that lies beneath York Minster. The basilica, part of the long established Roman settlement, was only discovered, along with the foundations of the Norman church, in 1967 during works to shore up the foundations of the Minster's Lantern Tower. These early finds are exhibited in the Undercroft. Why Admission Charges? Isn't the Minster a Church? Of course, York Minster is a place of Christian worship, and if you are there for religious services or to pray, entrance is free. But running the Minster, catering to the various needs of worshippers, sightseers, individuals, and school groups—up to 2 million people a year—plus maintaining the building's ancient fabric and providing for the occasional Anglican Synod—requires deep pockets and a hefty budget. There's a staff of 150—including those working as carvers and stonemasons in York Minster's own stone yard, glaziers who look after York's amazing stained glass, 500 volunteers who need to be organized and trained, and even a police force of nine constables. The only other church to have its own police force is St. Peter's Basilica in Rome. Amazingly, neither the UK government nor the Anglican Church contribute toward the maintenance of the beautiful and historically unique York Minster. That's why visitors have to. Reluctantly, in 2003, York Minster began charging entrance fees for non-worshippers. York Minster is the only Cathedral in the UK that puts mistletoe as well as holly on its high altar at Christmas. This ancient use of mistletoe, connected with Britain's Druid past, is also linked to York and the North of England. In the North of England, mistletoe grows on lime, poplar, apple, and hawthorn trees. Druids believed it had the power to ward off evil spirits. They also used it as a sign of friendship—thus the custom of kissing under the mistletoe. Because of mistletoe's connection with the Druids, the early church associated it with sinners and evil and banned mistletoe for use and display in churches. But they have always been a pretty independent lot in York. Mistletoe at Christmas remained popular there after the Druids were long gone. For a while mistletoe was incorporated into a service of repentance and pardon. York Minster held a winter Mistletoe Service where York's miscreants and evil doers were invited to seek forgiveness. Holding up a branch of mistletoe, the priest would declare, "public and universal liberty, pardon and freedom of all sorts of inferior and wicked people at the minster gates, and the gates of the city, towards the four quarters of heaven." Today, the Mistletoe Service is no longer offered in quite that way. But a sprig of mistletoe still decorates the high altar during the holiday season as a reminder of ancient customs and the spirit of forgiveness. York Minster's Central Tower, also known as the Lantern Tower, is an amazing feat of 15th-century engineering. Built between 1407 and 1433, it stands more than 230 feet—the height of a 21-story building, and weighs 16,000 metric tonnes—the weight of 40 jumbo jets! Anyone up to climbing the 275 steps to the top can enjoy close-up views of York Minster's pinnacles, gargoyles, and carvings. Climbing to the highest point in York, by a wide margin, visitors at the top of the tower can see across the rooftops to make out the city's medieval lanes and snickleways. The view also takes in miles of countryside, extending, on a clear day, to the Yorkshire Wolds. Children under 8 years old are not permitted to climb the Tower. Children under 16 years old can only climb accompanied by an adult. Groups of more than 10 children under 16 must be accompanied by at least three adults. Smaller groups of children can be accompanied by two adults. The Rose Window, a stained glass masterpiece high in the South Transept of York Minster, was nearly lost after lightning struck the Minster in the 1980s causing a severe fire in its wooden roof. The stonework of the Rose Window was completed in the mid 13th century but the stained glass was added near the end of the 15th century to commemorate the end of the War of the Roses and honor the Tudor dynasty. After fire destroyed the South Transept roof in 1984, inspection revealed that the stained glass in the Rose Window was severely cracked. The 73 panels, containing 7,000 pieces of stained glass had shattered into about 40,000 pieces! Miraculously it was all still in place. Craftsmen secured the stained glass with adhesive film before removing it, one section at a time. Special adhesives—which would mimic the refractive properties of the glass—had to be researched and were specially developed by 3M Corporation before the window could be restored. Each restored section is sandwiched between layers of clear glass—the restorers jokingly refer to it as a Tudor sandwich—and the whole is further protected by more sheets of glass. The stained glass restoration process, along with the restoration of the roof, took about four years and cost $4 million. York Minster's collection of Medieval stained glass windows is among the finest and rarest in the world. Most of the important windows, including the Great East Window and the Five Sisters still have their original, Medieval stained glass. Some of it dates from as early as 1270. More than half of all the stained glass in England is in York Minster. The Great East Window was painted by a Medieval stained glass painter, John Thornton, between 1405 and 1408. One of the leading stained-glass craftsmen of his day, Thornton was paid about £56 for his three-year effort, in 1408. Some estimates suggest that the payment would be worth about £300,000 today. According to an article in the Yorkshire Post, the current cost of cleaning and restoring the Great East Window is about £6 million. The BBC reported that the job could take as long as 15 years. In 2015, after the windows hid behind scaffolding for 12 years, glaziers began returning the cleaned and protected glass to the 600-year-old stone framework. And in 2016, experts said it would be another three years before the restoration was complete. Maintaining the Minster's amazing Medieval windows is a full-time job. There are 128 stained glass windows, containing about 2 million individual pieces of Medieval glass. Each window must be taken apart so that each piece of stained glass can be individually cleaned. Then the windows are reassembled and re-leaded. Each window is cleaned about once every 125 years. The beautiful and airy octagonal room is one of the oldest parts of the Minster. It was begun in 1260 and completed in 1286. Created as a meeting place for the Dean and Chapter of York Minster, it is still used for the same purpose. Although the Minster is the seat of the Archbishop of York, its day-to-day running and most of its daily worship services are governed and organized by the Dean—a senior Anglican priest—and a six-member Chapter, today composed of three Clergy Canons and three Lay Canons appointed by the Archbishop. The statutes that govern the Minster have changed very little since the first Norman minster was begun, in 1080 by Archbishop Thomas of Bayeux. Each of the seven walls of the octagonal room known as the Chapter House has six seats to emphasize the equality of the Chapter members. No one can sit in the center. The eighth side of the octagonal room is the archway of a passage leading to the nave. There are also seven windows—among the oldest in York Minster, with Medieval stained glass dating from 1270. Above the archway on the eighth wall, the stonework of the seven windows is repeated. The Chapter House Ceiling is a complex wooden vaulted structure. Created at the end of the 13th century, the ceiling is unusual for its period in that it is a free vault, unsupported by a central column. The decorative medallion in the center is hand painted with red, blue, green, ivory and gilt. And the central boss (the medallion-like circle connecting the radiating ribs), which would have been barely visible from below, is an elaborate, vividly-painted design featuring a lamb and other Christian symbols. Some of the York Minster's finest, most interesting, and oldest carvings decorate the walls of the octagonal Chapter House. Most were made by individual craftsmen between 1270 and 1280. Their ideas and sense of humor are reflected in the characters and gargoyles depicted, ranging from drunkards and shrews to souls in torment. York Minster still maintains a small staff of craftsmen, including stonemasons and glaziers, whose skill and artistry is the equal of their 13th-century predecessors. And they are still adding their own humorous touches to York Minster's carvings in secret places around the Minster. Among the carvings of the Great West Doorway, two tiny corbels, each about the size of a fingernail, are carved with the heads of a Klingon and a Ferengi—Star Trek characters. Elsewhere in York Minster, children have had a chance to contribute imagery for the ages. After an electrical storm set fire to the roof of the South Transept, the British children's television show, Blue Peter, invited its audience to contribute designs for bosses (the connecting medallions that join the ribs in a vaulted ceiling) in the new ceiling. Six were selected and can be spotted by the eagle-eyed—or with binoculars—in the ceiling, about 88 feet above. One of them shows Neil Armstrong's first steps on the moon.